From any page within the application bring down the drop down menu next to your name at the top of the page. Within that menu click on "My Billing". 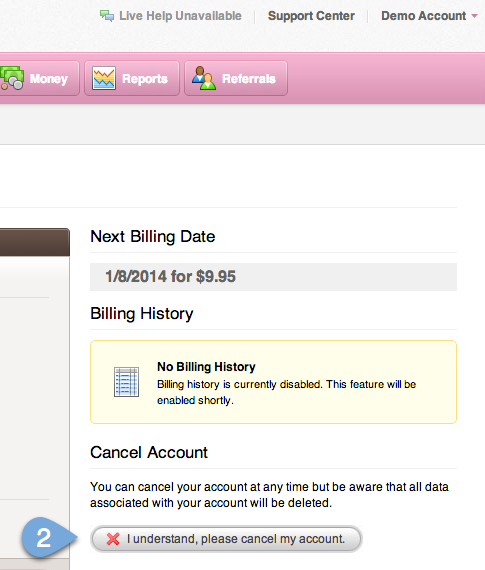 Step 2: On the "My Billing" page there is "Cancel Account" section on the right lower side of the screen. If you desire to cancel your account simply click the button "I understand, please cancel my account". Please be aware that when you cancel your Pink Office account all data associated with your account will be deleted immediately and access to the account will lost.